Please note the price is for machine with tooling. Our purpose is to serve log home builders. We want to know about you and your needs. We brought to the market number of other products which can be useful for you: LogWorksDesigner computer software for log home design, logworks manufacturing and assembling documentation, dedicated notch makers, log cross cut saws, log mortising machine, we also have rotary-type log through pass milling machine (log molder / profiler) able to process truckload of logs per workshift, timber home milling machine and other equipment. 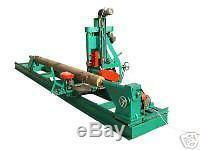 This machine is not a saw mill nor a band mill nor a log moulder. Is for manufacturing of log home or cabin shells (logworks, house logs). 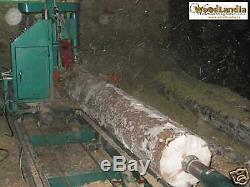 It is able to process logs up to 26.5 foot (8.1m) with diameters from 7 to 19 inches (160-500 mm). It is simple to operate "four in one tool". 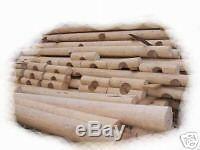 It turns green or dry log into a giant cylindrically-shaped dowel (up to 18 in diameter), mills lengthwise groove (Swedish Cope), round notch and kerfing. Average productivity of the lathe is one log per 20-60 minutes including manual loading and unloading. The productivity depends on characteristics of logs and operator experience. 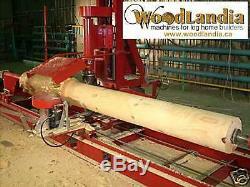 Machine itself can turn 12" log into 10" dowel with Swedish cope during 3-10 minutes ("heavy tapered" logs require more time). For detailed technical characteristics please visit our web site. Woodlandia is Canadian company dedicated to the supply of cost effective and reliable solutions for log home builders of North America. We sell machines since 2004 and in North America since October of 2007. Since 2017 we offer few new log lathe models. We will provide you with detailed description, specification, video and pictures. Setup & installation requirements, FAQ, etc. Specification can be changed without notification. Length: 33 ft (10 m) Width: 5 ft (1.5 m) Height: 7 ft (2.1 m) Weight: 4080 lb (1850 kg). 30A, 3 phases, 380V, 50Hz. 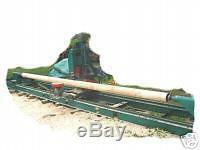 Min log length: 18 (460mm) Max log length: 26.5 ft 8100 mm Min input log diameter:7 (180mm) Max input log diameter:19 (500mm). The lathe is able to produce round logs dowels with diameters in range between 6 and 18 inches (150 - 460 mm), Swedish Cope & Round Notches for logs with diameters in range between 6 and 12.5 inches (160 - 320mm). 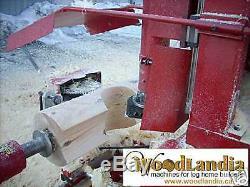 The lathe is supplied with set of HSS knives and cutter heads. Optional knives of different sizes can be ordered. Output depends on skills of operator, quality of input log and the organizational proficiency of the production process. Average output is 1 log produced every 20-40 minutes or 12-24 logs per 8h work shift. Required personnel: for optimal productivity, 1 operator and assistant is recommended. Rough (cope) cutter motor: 3520 r/min, 19 A, 11 KW (14.74 HP). Rough cutter can remove up to 70 mm per diameter (pine, spruce, fir, cedar) 2. Fine (notch) cutter motor: 3480 r/min, 5.8 A, 3 KW (4.02 HP). Fine cutter can remove up to 20 mm per diameter (pine, spruce, fir) 3. Kerfing saw motor: 3480 r/min, 2 A, 1.1 KW (1.48 HP) 4. Carriage moving motor: 1650 r/min, 0.7 A, 0.25 KW (0.34 HP). 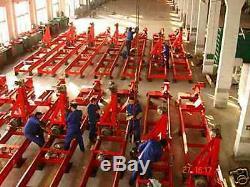 Horizontal carriage speed: 0-13 ft/min (0-4 m/min) 5. Fine cutter moving motor: 1625 r/min, 0.66 A, 0.18 KW (0.24 HP). Vertical fine cutter speed: 0-13 ft/min (0-4 m/min) 6. 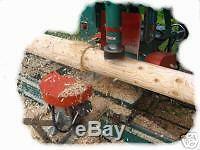 Head stock (log spinning) motor: 1480 r/min, 5.8 A, 3 KW (4.02 HP). Log spinning speed: fixed 32, 42, 50 r/m 7. Tail stock motor: 1650 r/min, 0.7 A, 0.25 KW (0.34 HP). Extending or decreasing tail stock log holding pike. If you have questions please inquire. If customer requires we can provide installation services on the customer's side for extra cost 5. We provide training if necessary. Please refer to blue text above. ; - you do not know what you need this machine for; - you are not in construction forestry or wood processing business or you do not have enough knowledge in these areas; - you are not sure about your financial perspectives. In all cases we will be glad to answer your questions. 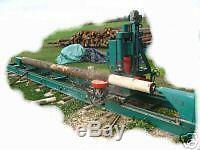 The item "Log home house cabin manufacturing machine / log lathe" is in sale since Friday, May 29, 2015. 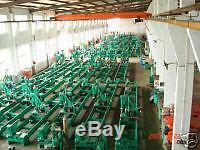 This item is in the category "Business & Industrial\Agriculture & Forestry\Forestry Equipment & Supplies\Equipment". 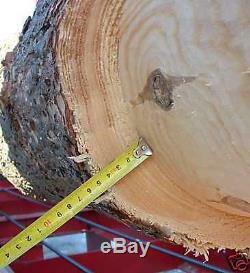 The seller is "woodlandiadotca" and is located in Ontario. This item can be shipped worldwide.